Το κείμενο δημοσιεύθηκε στο www.theatlanticcities.com και αναφέρεται στη χρήση των ανοικτών δεδομένων για τον μετασχηματισμό των τόπων. Μεταξύ των προτάσεων είναι μερικές γνωστές καινοτομίες που έχουμε ήδη συναντήσει στις Ατλαντικές Πόλεις ως πρώην ανώριμες ιδέες που τώρα ανταγωνίζονται για μια ευκαιρία να αναδειχθούν. Οι αγαπημένες μας περιλαμβάνουν την εκστρατεία guerrila wayfinding από το Raleigh, North Carolina, το παιχνιδιάρικο StreetMix web app από το Code for America, το Urban Prototyping Festival του Σαν Φρανσίσκο, και ένα έργο σχεδιασμού συστημάτων μεταφορών που βασίζεται στην συμμετοχή της ευρύτερης κοινότητας και στο είδος της ανάλυσης δεδομένων για το οποίο γράφουμε εδώ. "Parents now can choose a public school for their children – but are overwhelmed by the process. Our web application will let parents indicate what attributes of a school are important to them, then rank and compare schools based on those attributes." "Floodprint helps communities actively track changing flood footprints due to development and extreme weather by collecting data from citizens and governments, informing better policy decisions to reduce flood risk and community vulnerability." 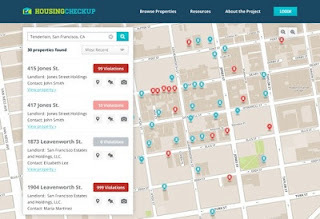 "Provide a sustainable free open data hosting and publication service for local governments lacking the resources to deploy and maintain their own dedicated open data portal, to be built with open source software and standards-based cloud services." 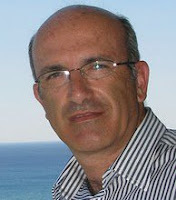 "Public meetings are broadcast online. They should take input online as well. This tool would help people who are unable to physically attend a public meeting to register their vote and have their voice heard on decisions elected officials are making." "Why Don't We Own This? puts the government and the people on the same platform to share data, communicate, and plan for the use of urban space. WDWOT is x-ray glasses to see who owns the world around you, where opportunities are, and what's at risk." "Without open, easy procurement government will consistently pay too much for the development and implementation of yesterday's technology. Procure.io is a proven system to make government buying simpler and increase government's access to tech." "The Possible City is a web platform that will enable citizens to instigate organic growth of communities and economies through the re-purposing of vacant properties for innovative new uses." "Everyone deserves to live in a safe and healthy home. 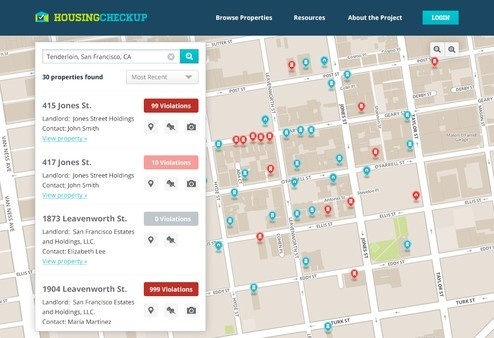 HousingCheckup provides tenants and their advocates access to a property’s complete health history, including landlord information, current code violations, and past health and safety inspections." "Chicago Crash Browser is a new tool needed by planners and engineers to analyze where the Chicago should invest in infrastructure upgrades to eliminate traffic fatalities by 2022, and educate residents & elected officials about transportation safety." "eCitizens helps local municipal government make their records available, searchable and usable by anyone! We get and store agendas, minutes and reports from America's municipalities and alert you when keywords you care about are mentioned." "This MapMill modification allows anyone to rate the damage depicted in aerial photographs following a disaster. These geolocated judgements are used to form a damage assessment grid to help prioritize efforts on the ground by professional responders." 12. Anywhere Ballot — what if anyone, anywhere, could vote on any device? "Anywhere Ballot is a “ballot in a box” tool that local governments, nonprofits, and citizen orgs can use to create ballots, hold elections, and see results in an accessible, trusted way. Some day, we hope it changes the way we vote in all elections."